What follows is the first image that comes onscreen in the film ‘Home Movie’. 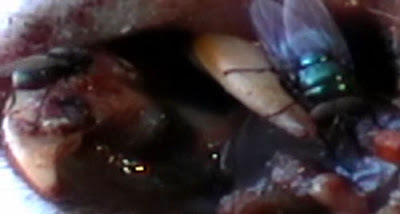 An arresting image, to be sure, for anyone who doesn’t want to look too closely, it’s flies buzzing around inside rotting roadkill. That is either a really big fly, or a really small dead animal. 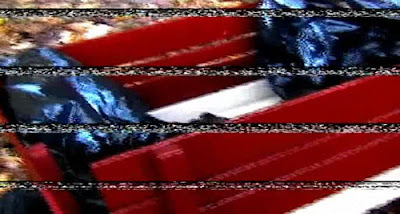 It turns out to be the second – a squirrel, which the cameraman then picks up, places in a garbage bag, and sticks in a little red wagon. So, from these three (okay, really only the first and third images were relevant) key visuals, what have we learned? That this is a movie about a killer child. So, exactly one minute into the movie and all suspense has been stripped away, and all that’s left to wonder is how long before the child murders his/her parents. In a well-constructed film that wasn’t ruined by its opening images, this ‘clubhouse’ could be a surprise. We might be sure that it was going to be used later in the film (why introduce it, otherwise), but since the first moments of the film let us know, beyond a shadow of a doubt, that the children are sick freaks the only reason for that clubhouse to exist is so that later in the film the parents can enter it and discover that their children have amassed a collection of already-dead and newly-murdered animals. Which is exactly what happens. Way too late in the film. You see, Home Movie is largely a film about parents realizing their children are evil far too slowly for it to be believable. What’s strange is that there are a few choices in the film that might actually have led to it being effective, had this been a better-written film overall. One of these choices was to have the children be largely silent for the entire running time, only speaking during a brief sequence of pretending to be normal, and at the end when they take the video camera and decide to make their own ‘Home Movie’. The other interesting thing about the film is the way it wants to be oblique about just what’s causing the children to be so evil. It tries to raise some interesting questions in that the father is a Lutheran Minister, who thinks that demonic possession is the likely culprit, while the mother, a child psychologist, feels some mixture of personality disorders must be responsible. This debate is all well and good, but the film has the parents making it far too late into the film. The central conceit is that, apart from the first segment, shot when the camera is first purchased, that the bits of video we see are only from Holidays when the camera is turned on to record precious memories that invariably go horribly awry. This premise allows us to overlook the fact that the parents aren’t alarmed by the way their children never speak, because presumably they’re talking at some point while off camera. It creates a much bigger problem, though, in that while we’re seeing the story unfold over a much longer period of time than most films, the characters certainly aren’t using the time when the camera is off to do anything realistic – in point of fact, the don’t seem to be doing anything at all during these periods. Take, for example, the children’s notepads. While on camera not only do their speak in whines and grunts that function as their own private ‘twin language’, but they’re forever drawing pictures and making notes in their large pads of blank paper. The mother doesn’t like this secrecy, and thinks it would be a good idea to get a look at what’s on the notepads, but the kids won’t show them to her. It seems like there’s a natural remedy to this situation – look at the notepads while the children are at school or asleep. But because the wife doesn’t exist when she’s not on camera, she never gets around to doing this. Likewise, the parents never get around to searching their children’s clubhouse, even after their wacky behaviour includes: Throwing rocks at parents, putting goldfish in a sandwich, crushing frogs in a vise, and crucifying the family cat. 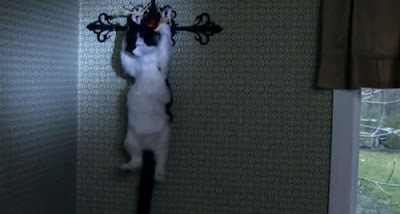 Now, one might expect that crucifying a cat would be outrage enough to get those kids into intensive, locked-in-a-room-for-23-hours-a-day kind of therapy, but no. She just feels like she should spend a little more time talking to them. But as a doctor now, because it’s a fantastic idea for a mother to try to counsel her own children. Yeah, that’s the dad lying in bed with the kids. Under the covers. They’ve got deep bite marks all over their arms and legs, and claim that a ‘man in the closet’ did it to them. Oh, and in a confessional immediately after this the wife happens to let drop the fact that the dad was molested by his parents as a child. Gee. I wonder what's wrong with the young'uns. Yet it takes until Valentines Day – six full weeks, for the mom to decide to take the children to her parents’s house. A plan that is interrupted when they get a call from the school, announcing that the two kids had dragged another child into a school bathroom during an assembly, and viciously bit him all over his body - in a weird note, they go out of the way to point out that the kids locked the bathroom door, so I’ve got to ask… do public bathrooms in schools have locks that children can work? Because it doesn’t seem like that would be safe. Anyhoo, in the mother’s mind the mystery has been solved – dad wasn’t biting the children, the kids were biting each other! Okay, fine, accept that solution. So why was he in bed with them? Remember that? It’s only after the children have gone completely nuts and been expelled from school that the parents start to do something about it, and even then it’s kind of an odd reaction: they put the kids in different bedrooms, and then the mom writes them a prescription for antipsychotic drugs. Because, again, it’s ethically really solid to diagnose and write scrip for your own family members. Then comes one more scene where the silent onscreen children really hurts the proceedings – what could have been a genuinely disturbing scene of the mom giving the son a Rorschach test is elided over by, you guessed it, a fast-forwards. No, instead of the creepiness that could come from the actual Q&A, where just get the generic scare of the son grabbing her arm when she tries to get the pictures back. The children are drugged and the dad performs an ersatz exorcism, then the movie fast-forwards two months to Easter, where at least one of the two techniques seem to have been successful, since the kids are content as all-get-out, finally speaking on camera and having friends over. The friend who’s over that day? The same kid they viciously bit that one time. Who must have the only set of parents worse than the ones at the center of this movie. Of course the good behaviour is all an act, and the kids try to murder their friend, dragging him down to their murder clubhouse, which, of course, proves to contain all their drawings of murder and mayhem, as well as dozens of animal corpses. That’s right – in four months of intense concern about her children’s mental state the mom never got around to looking at their notepads, or swinging by their nefarious hideout, which was just a hundred feet away from their house. So the kids have attempted to kill someone, but they were stopped in time. And this, coincidentally is where I’m going to wrap-up the review, because the last twenty minutes are so stupid that they don’t deserve to be vivisected with any degree of care or detail. Let’s just say everything everyone does manages to be incredibly stupid both in its absence of any semblance of logic, and its totally lack of relation to the way humans behave when under stress. I wash my hands of the film's horror-cliche climax. Home Movie cripples itself out of the gate, and then just gets worse from there. It’s the perfect example of just how much damage you do to a film by giving away too much at the beginning. It’s by no means a good movie, but had they not shown us their hand right at the outset there would at least have been the fun of discovering what secrets the film had to offer. By showing their hand immediately, the filmmakers left their audience with no reason at all to watch their film. In evil kid movies, you always know the kids are evil right from the start. The whole point is to explore the evil, so really it's more about the journey. It seems this movie was trying to do just that, only the journey was badly planned and ill-advised to begin with.